Imagine you work at a motorcycle dealership that sells only the most exclusive of brands from Italy and Germany. 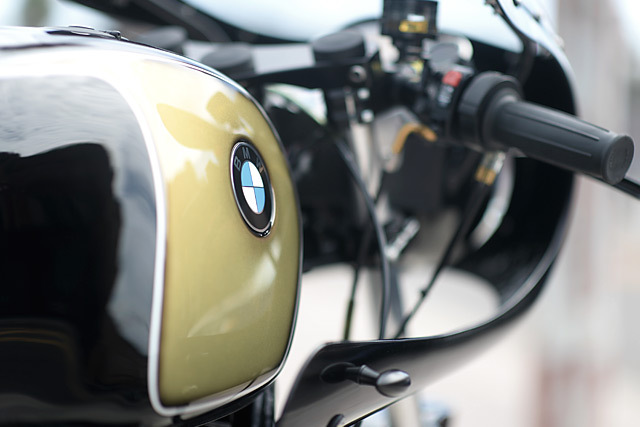 You also own the latest and greatest BMW Sportsbike on the planet. Do you really need another bike that was also built for the road and is nearly 30 years old? Of course you do! 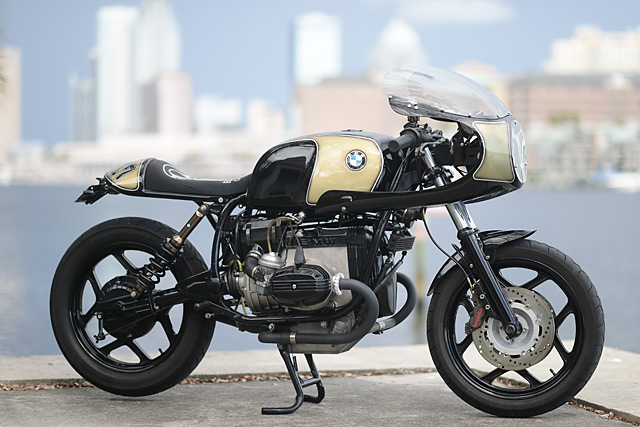 And that’s why Joe DeMoss built this stunning 1988 BMW R100RS over a period of nine months. Because motorcycling runs in his veins. Because working everyday at Florida’s Eurocycles of Tampa Bay has made him a hands-on kind of guy. And because his fondest memories are of he and his father sharing time in the garage working on just about anything with wheels. 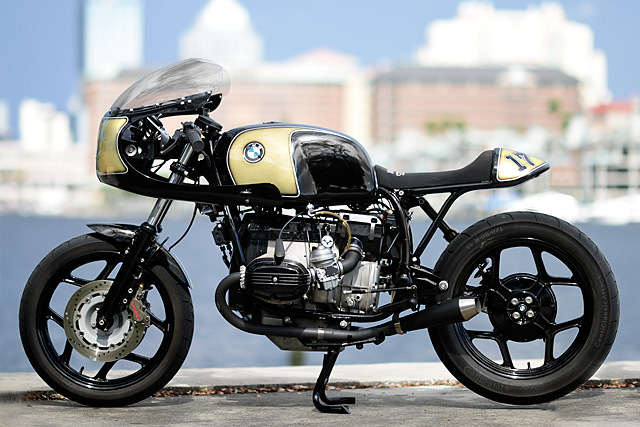 The R series of BMWs from the 1970’s and 80’s have become particularly popular on the custom scene over the last few years with the R65 and R100’s being turned into everything from trackers and scramblers to café racers and specials, but Joe has cleverly blended the racer look with some café styling for a bike that is perfect for any given Sunday. You can’t build a bike this clean without going back to a bare frame and getting every detail right and that’s exactly what Joe has done. Splashed in black the frame is arguably a better visual than when it emerged from the factory, even the sidestand and centrestand are perfect and their helper springs didn’t miss out on a coat of black either. A mix of paint and Profab powdercoat means that the surviving brackets and tabs disappear leaving the more visually impactful elements to jump out. Finally Moe could get the spray gun out and lay down the picture perfect paint job that is a mix of deep black broken up by curve matching white pinstriping that allows the black to gently seep into the lime gold for a head turning finish that’s show like quality. 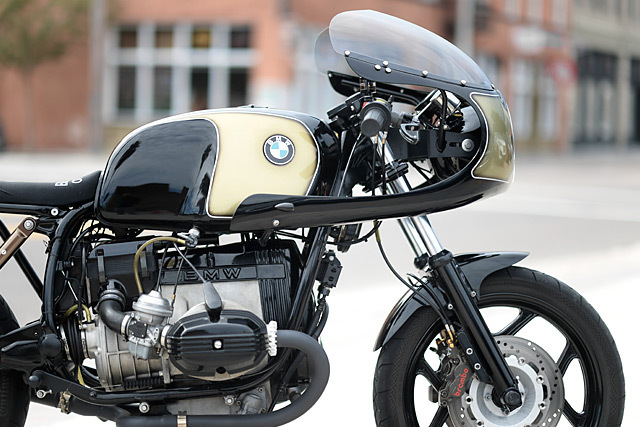 The paint on the factory tank is masterfully laid down to round out the squarer elements of the BMW design with the knee recesses now aesthetically pleasing rather that just a functional element. 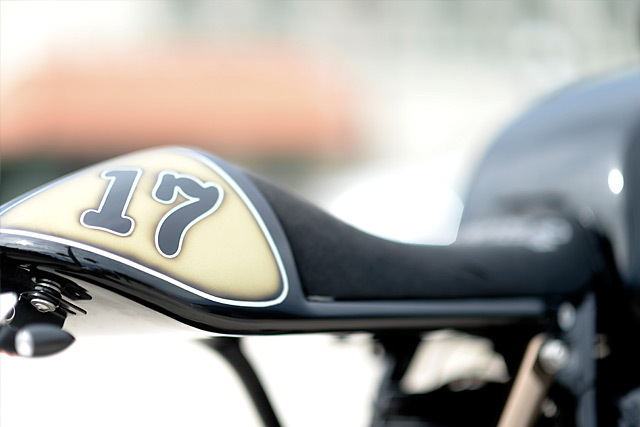 The seat hump adds to the racer authenticity with period correct race numbers on each side and whether with gun or brush every inch is a masterpiece. While there is no rear guard the underside of the seat is steal protected and the new front guard is given the black paint treatment so it serves its function without distracting from the form of the design. When it comes to impact the paint by Moe Colors is nothing short of spectacular. 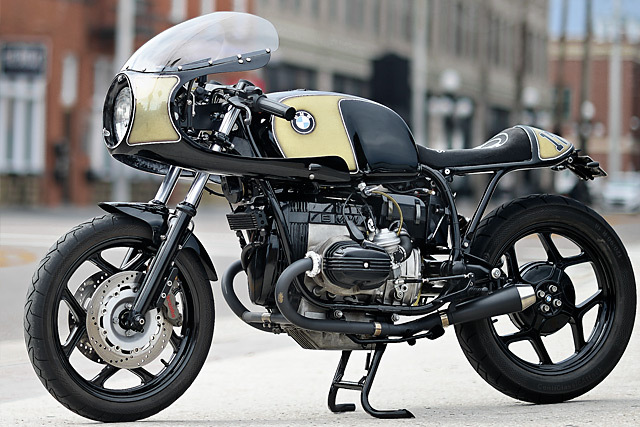 But to get there first Joe had to make a decision on the look of the bike and the Ducati Monza style fairing gives a smooth racer feel to a BMW that once was as square as the side of your house. The clear screen, the perfect construction of the supports all finished in frame matching black and high quality bolts all add to the depth of detail that makes this such an impressive machine. With the front end sorted attention turned to the rear and just what sort of look would compliment the Ducati front. With nothing off the shelf ever going to be good enough Joe turned to Will Benedict who built an integrated seat/subframe combo from steel that is truly out of this world. 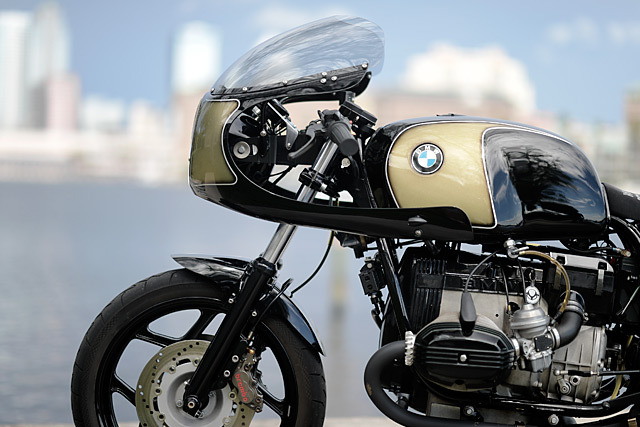 Where once there was box section and bulky glass fairing now there is smooth lines and A grade metalwork that finishes in a café hump in true racer styling. 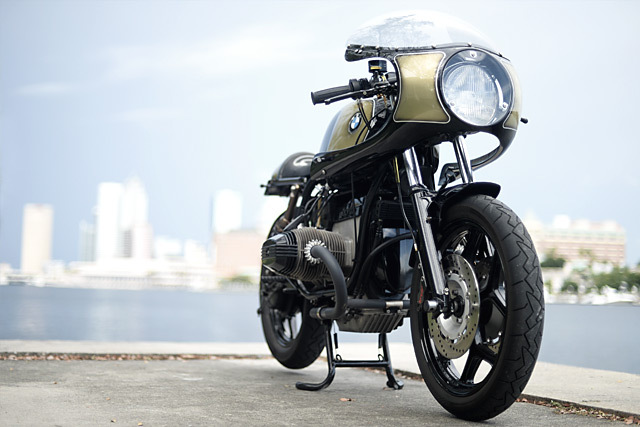 To get the old BMW handling more like a modern bike, Joe has high standards with his other steed being a BMW S100RR, both the front and rear have been overhauled. The front forks are clamped in place with the stock triple trees but new progressive rate springs in the standard forks give much better front end feel. While out back the inverted mono setup is controlled by a fully adjustable single shock with a progressive rate spring. If the R100 had a deficiency from the factory it was in the braking department, power was ok but the feel was less than confidence inspiring. To fix that and reduce weight in the process Joe has adapted the supreme Brembo CNC P4 calipers to work with the drilled front rotors and the power comes from a Brembo RCS19 master cylinder. With all that effort gone to improving handling and braking performance it made perfect sense that Joe steered the beast with quality components and the Woodcraft clip-ons are exactly that. Modern levers and switchblocks keep things clean with all the vital stats coming from the Speedhut GPS speedo/tacho combo. While the engine remains largely standard it has been given a new make over and the Endurolast charging system brings the electrics into the 21st century. 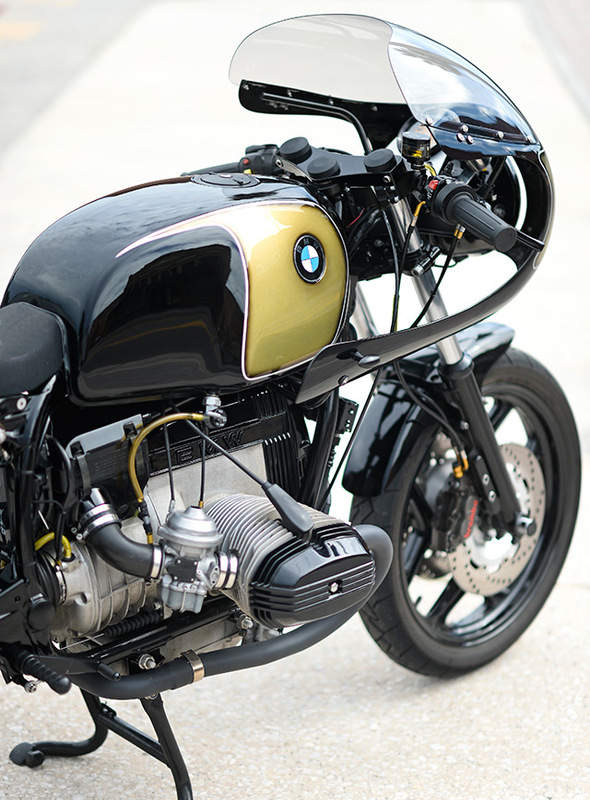 But a bike that looks this good needs a sound track to match and Will brought his incredible fabrication skills back to the party to knockout one of the best 2 into 1 systems you’re ever likely to see on a BMW, cross over pipe and all. While the build took nine months, much of that time was spent waiting on parts to arrive and the bank account to recover. Once the pieces had all arrived it took Joe just three nights to assemble this spectacular machine. Where once the 31-year-old would fall asleep on the tank of his Dad’s Big Honda, now he calls the shots and cranks the throttle on a bike of his own – a bike that is the ultimate culmination of a lifetime’s passion for speed.